Registration is closed. Limited seats may still be available! Call 713-681-8433 for details. Eco-printing uses natural materials like leaves, flowers, and metals to create beautifully dyed fabric. 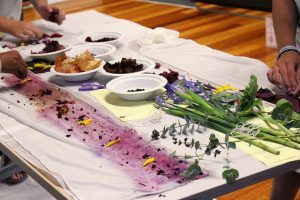 In this class we’ll be using materials gathered from the Arboretum to create colorful patterns on silk scarves. While we wait for our scarves to set, we’ll explore the grounds to discover more wild natural dye plants. Notes: Wear clothes you don’t mind getting messy and dress for the weather.